This entry was posted on Tuesday, September 20th, 2011 at 23:15 and is filed under Uncategorized. I struggled with how to title this article. I’m not interested in celebrity or fame, and I prefer to communicate with ideas, but I have a growing folder of email questions in my inbox that are essentially inquiries about me, personally. People wish to know about me, and all sorts of details about my life, and I hope you’ll understand if I demur from answering all of these questions. Most people want to know about my writing, and things related to that broad topic, but many have asked me where I find the time to write as much as I do. I have a confession or two to make on that score, but I’ll cover that in due course as I explain my answers on some of the other things you’ve asked as you’ve gotten to know a little about me over the last two months. You’ve asked. Now, I’ll answer. I am a network engineer and a systems analyst. I work with computers in a challenging and difficult field, and my primary duties involve firewalls, switches, routers, VPN concentrators, and a few other types of devices. My other duties involve the maintenance of a large database and the front-end application through which my user base enters and updates that data. That job has consistently taken 12-15 hours of my day, each day, for a long, long while. I enjoy the work and find the results very satisfying. My first work with computers was in 1981 in a high-school computer lab, a novel idea at the time, and the computers were all Tandy TRS-80s. We used cassette recorders as our storage device, since they had no floppy drives, and RAM was a whopping 16KB. We’ve come a long way. I’ve been working professionally in Information Technology since the mid-1990s, but I still rely on some fundamental knowledge that was gained all the way back at the beginning of my association with computers in 1981. We have a small thoroughbred farm. It isn’t much, and given the state of the economy, and the widening Obama disaster, I doubt we’ll hold out much longer. We began this enterprise eleven years ago when the market looked much more promising, but five of the last eleven years have been in some stage of drought, and legislative and executive intransigence in Texas has left the thoroughbred industry in a state of total collapse, by failing to permit the racing industry in our state compete on par with our neighboring states. Thoroughbred breeder who could have fled the state, and in Texas, horse-racing is once again becoming the “sport of kings.” At present, the average horse at sale in Texas isn’t bringing one-thousand dollars. One can scarcely bring a new foal from breeding to sale age for five times that amount. I tinker with various things, and I am a fairly skilled mechanic, do rudimentary machine work, and welding as needed. These are all skills used on the farm in the maintenance of equipment, that I learned in the Army, but also what I once did for a living before completing my college studies. Speaking of college, I didn’t attend until well after my Army career, beginning classes at age thirty. I’ve done a variety of jobs over my life, always intent upon paying the bills. Like I said, I’m an ordinary guy with a keyboard. As for the writing, I choose to write about what interests me. As you can imagine given what I’ve already told you about my life, you can probably guess I’m generally always pressed for time. That’s definitely true. There really aren’t many spare moments in my days, and that’s more or less how I like it. I write during most of these “spare moments” nowadays. I’ve always written, but I’ve never been determined to have some sort of outlet. Much as our current national situation has brought about the Tea Party, and also their support for Sarah Palin, so has my expression followed a similar genesis. I’ve been writing all along, not as frequently, but until lately, it was almost entirely private. Now, remembering how I started, I promised you a confession. The simple truth is that my writing would be much more infrequent without the support of my wife, Evelyn. Without her to pick up my slack, I would be constrained to a small fraction of what I’ve been writing. There wouldn’t be a markamerica.com without her efforts too. She thought my writing should have a public outlet, so when you thank me, know that it’s she who deserves the thanks. As you know from reading this blog, I formulate my take on events in the news based on my own life experiences. Since I haven’t led any sort of particularly extraordinary life, this leads me to a second confession: I don’t think I’m doing anything that most of you could not do. 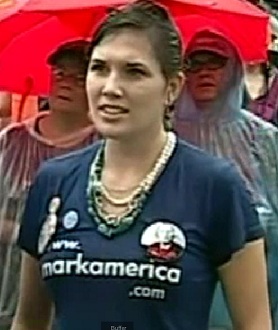 If you watched the coverage of the Tea Party event in Indianola, IA, on C-span earlier this month, you may have seen a rain-drenched young woman in a blue markamerica.com t-shirt in the front row of the crowd. She had that shirt made just for the occasion. She’s why I write, and put my thoughts out in public. My daughter has a right to a future full of promise as I have had, and the ability to succeed or fail on her own merits. So do your children. That’s what the “America” in my name here actually represents. That’s it. I have had a few other questions that I’ve chosen not to answer at this time, but don’t be surprised if you find the answer in some future posting in this blog. I’ll eventually get around to telling you everything about me in one way or another, if only in through how I view the world. Some of your questions about me have already planted the seeds of future postings. Thanks for reading! In the two months this blog has been up, I haven’t ceased to be astonished at your kindness and your responses. Even when you’ve disagreed, the vast majority of you have been civil about it. That’s part of what makes this audience different from most I’ve seen. I also know it is a measure of the character of Tea Party patriots and Palinistas who tend on most days to dominate the readership of this site. Thank you! I appreciate all of your insight…..thanks for posting! whenever I feel like taking a day off from the battle of taking back this country from the socialist, I always seem to happen upon one of your articles and they always inspire me to jump back into the fight, and the way I figure it, if your writing does that for a knucklehead like me, I know how much more your writing must mean to those much wiser than me. Maybe someday the human race will wake up to the fact that socialism is not a form of Government that will ever work, history is littered with the corpses of nations who have fallen victim to its allure. So carry on Mark America for its going to be a long and hard fight. That really touched my heart man…thanks for sharing…. Keep on keeping on man!!! We out here appreciate it!!!! Mark-Have enjoyed your posts gives us another insite that is valuable. Sorry to hear about your difficulties. Like you I have struggled for many years and then I allowed my son to make some input. We downsized our business and took another approach and in one year went from 20 years of red to the black side. We did this in our current down economy, so I know it is possible to be successful if one cuts to the bone, work harder, and change methods. Obama could learn a ton from our small business, but that will never happen, he is beyond help. Good luck, hang in there and have faith. The first of your posts was an open letter to Sarah Palin and I've been a regular and eager reader since. You're mistaken that I could do what you do. Had I the gift of articulating thoughts and ideas that you have, I might be able. As it is I refer others to your skillfully written essays when I want the message communicated. Thank you for what you do. Mark, your writing is very inspiring. I truly believe that when Sarah throws her hat into the ring, you will be the one leading the way to victory. I know she knows about Mark America. I started reading your blog in the beginning. I, like so many of your readers, are very busy and don't have time to read them all. But I put them in a special file and when I have time, I go back and read them. Thanks again, Mark. You are a man who is "On the Mark!" That could be the name of your new TV show, my friend! And the shirt with markamerica.com on it….what a great idea!